looking as if giant biblical characters, after a search for oil or wine, had popped them there, among the dwarf streets"
It resembles no other industrial area I know. I was at once repelled and fascinated by its odd appearance. 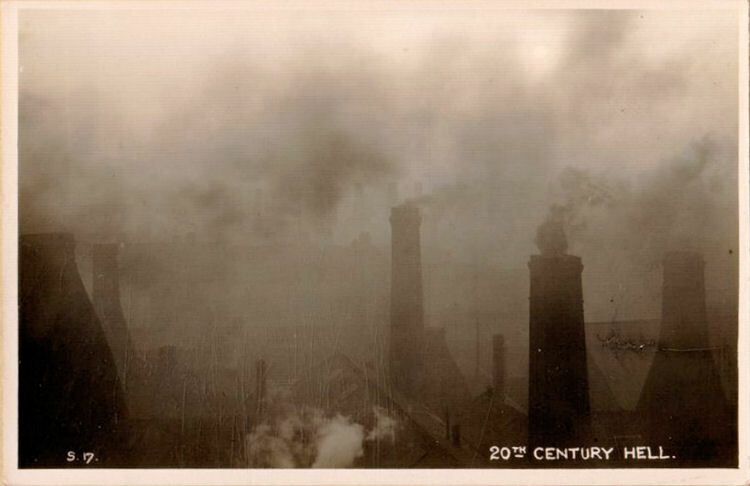 Perhaps it was all the more curious to me because, being a Yorkshire-man, when I see so much grimy evidence of toil, I also expect to see the huge dark boxes of factories and the immensely tall chimneys with which I am so familiar. Here, however, although there was more smoke than I had ever seen before, so that if you looked down upon any one of these towns the drift over it was so thick that you searched for the outbreak of fire, there were no tall chimneys, no factory buildings frowning above the streets; but only a fantastic collection of narrow-necked jars or bottles peeping above the house-tops on every side, looking as if giant biblical characters, after a search for oil or wine, had popped them there, among the dwarf streets. These, of course, are the pottery kilns and ovens, which are usually tall enough to be easily seen above the rows of cottage houses. I never got used to their odd appearance, never quite recovered from my first wild impression of them as some monstrous Oriental intrusion upon an English industrial area. 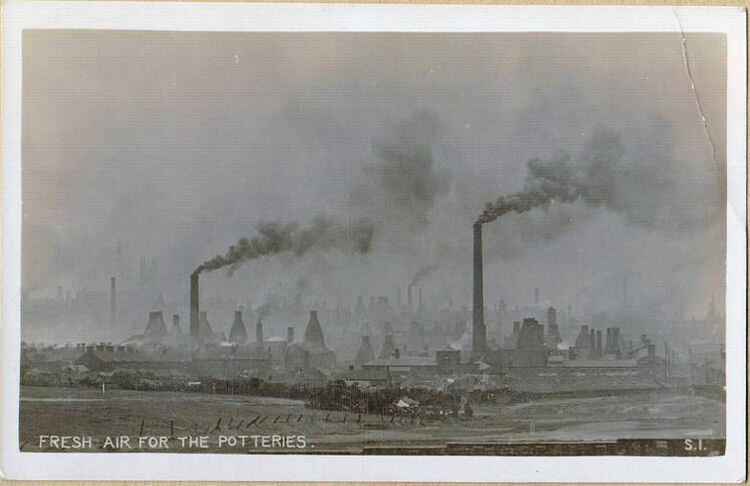 But without these great bottles of heat, there would be no Potteries. They represent the very heart and soul of the district, as you very soon learn;"
"Beauty was achieved, and none saw it"
"In front, on a little hill in the vast valley, was spread out the Indian-red architecture of Bursley - tall chimneys and rounded ovens, schools, the new scarlet market, the high spire of the evangelical church……the crimson chapels, and rows of little red houses with amber chimney pots, and the gold angel of the Town Hall topping the whole. The sedate reddish browns and reds of the composition all netted in flowing scarves of smoke, harmonised exquisitely with the chill blues of the chequered sky. Beauty was achieved, and none saw it". 'That is what Hell will be like,' she said solemnly, 'only worse. 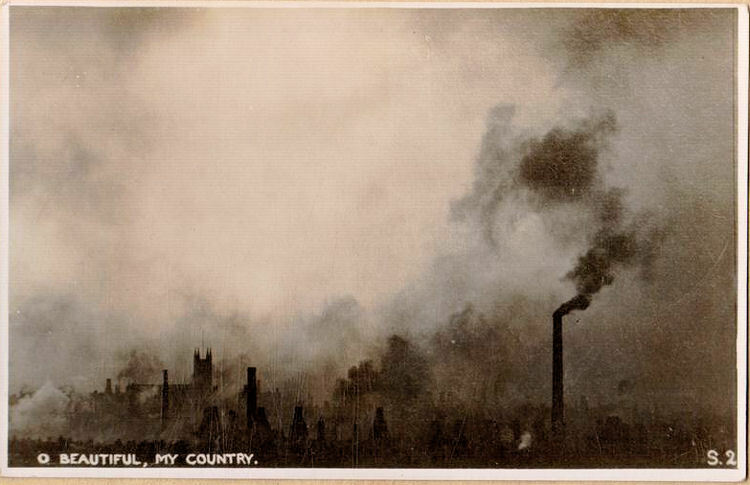 "At night, in winter, the infernal landscape could be seen at its most exciting: flames and sparks leaping upwards out of the pot-banks, many only half a mile away, perhaps less, turning the clouds of smoke orange and pink, sometimes fiery red, the whole angry skyline seeming to heave with the frantic effort to burn and heat and scorch. I loved to watch it, this volcano nightscape, which I thought of as a natural phenomenon, not man-made. I stood on a chair, to see it better, my mother behind me. 'That is what Hell will be like,' she said solemnly, 'only worse. How lucky we are that none of us will go there, because we say our prayers.' Then she told me about purgatory which, I gathered, had smaller furnaces and less alarming outbursts of flame, and anyway did not last long. 'I hate those pot-banks,' she said. 'There must be a better way of baking the pots.'" 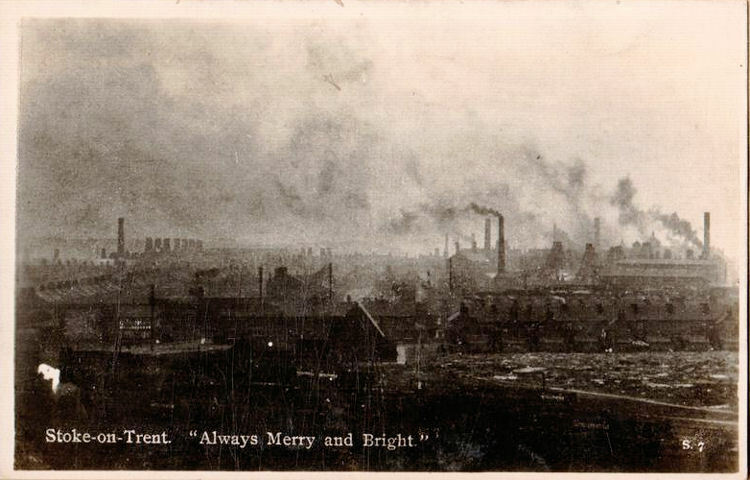 Stoke-on-Trent "Always Merry and Bright"